12/08/2018 03/04/2019 - by Liam Weisman - 6 Comments. MSI has for a long time demonstrated its knowledge of user needs and demands, tailoring laptops to meet the desires of all users in their respective categories. 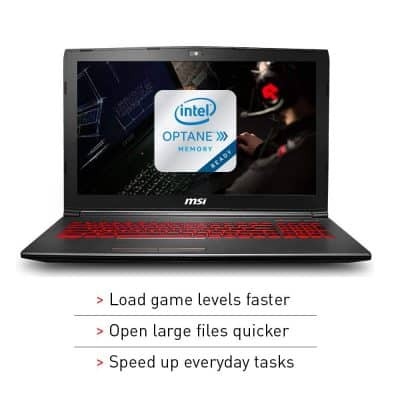 The MSI GV62 8RD-200 joins the ranks of entry-level gaming laptops with a rich set of specs and impressive new entrant, an Intel Optane memory, that goes a long way to improving its performance. However, it suffers a fairly short battery life, effective but the loud fan and a fairly fragile plastic body. Beside the trade-offs that follow its aggressive pricing, the MSI GV62 8RD-200 makes an excellent entry level gaming laptop at a very affordable cost. It makes an excellent choice for users who need a moderately powerful yet mobile daily driver without the burden of an over the top price. The MSI is, without doubt, a household name in gamer circles and beyond. One of the reasons MSI is well known is because of their reliability, as well as the variety that they come in to suit the needs of the larger majority of users. The MSI GV62 8RD-200 is a new entrant into the line-up but boasts little more than the 8th Gen. Coffee Lake Intel Core i5-8300H processor above its fellows. It features the exact same body as most of its siblings, only differing in the internals such as the processor, graphics card and internal storage. Similar to other MSI models, the dragon logo is hosted close to the top of the lid, though, with no back-lighting. The lid is made of a gray plastic with a smooth matte finish – which is pretty inviting to fingerprints. This is perhaps where we find the biggest cost-saving measures of the MSI GV62 8RD-200, opting out of the all-aluminum body that we all love. The use of plastic is in and of itself not bad, but the MSI GV62 8RD-200’s body seems light and subject to considerable flex. While opening the lid with one hand, one can’t help but notice the lid wrap under the strain. The keyboard deck and bottom plate, on the other hand, are quite sturdy and demonstrate negligible flex. When it comes to maintenance, you’ll be glad to know that it doesn’t take a tech guru to find his/ her way to RAM and Hard drive. The bottom plate is easily removable by unscrewing a few screws to give access to all the internals you might desire to upgrade. It’s also impressive to note the dual fan set-up and the six copper heat pipes that do an excellent job in thermal management. On flipping open the lid, one is ushered to a gorgeous 15.6 Full HD TN display bound within a moderately thin bezel. It renders a fast 120Hz refresh rate which takes care of screen tearing when playing fast-paced games and movies. Color accuracy is also very impressive out of the box. Unlike most TN panels, this one offers quite wide horizontal viewing angles. Vertical viewing angels are however not as impressive, as can be seen in the photo below. Having a TN panel is not necessarily a bad thing if you ask us – especially considering the price that this unit retails at. True, TN panels tend to be the weakest in terms of color accuracy and viewing angles, but they have slightly faster pixel response times than the other panel types. IPS panels, on the other hand, tend to have better color accuracy and viewing angles, but dark areas tend to glow a bit, hurting their contrast. Working on an assignment in the park under direct sunlight isn’t a thrilling experience owing to the low brightness that the MSI GV62 8RD-200’s screen offers. At 250 nits, this 15-inch gaming laptop screen is bright enough for everything you would dream of doing indoors with the comfort of minimal eye strain thanks to the screen’s matte finish. We noticed that colors were rather washed out to some degree and did not appear as striking as what we had seen in other displays. However, considering that the MSI GV62 8RD-200 targets entry-level gamers that need a powerful yet portable machine at a steal, it is not too great a letdown. For productivity, gaming, and entertainment, it’s just fine. The Lenovo Ideapad 330 laptop we reviewed recently has an almost similar brightness when it’s just a daily computing tasks laptop. The MSI GV62 8RD-200 comes with a comfortable set of chiclet keys from Steelseries, that are among the most comfortable you will find in a gaming laptop. They have just the right among of key travel (1.7mm) and require just enough actuation force to give you that tactile and responsive feel. The keys have a two brightness-level back-light that lights up red – in line with the gaming theme. Right above the keyboard deck is three buttons: Power, MSI Dragon Center and Cooler Boost. The MSI Dragon Center key opens an on-screen display window that lets you adjust various settings on the system according to your tastes and preferences. For instance, it allows you to select the audio modes from a list of 7 alternatives that span from music through shooter to racing mode. You can also select fan speed from auto all the way to advanced, not to mention display RGB modes that ranges from standard to light mode. The MSI GV62 8RD-200 comes with a pretty neat selection of ports – nothing out of the ordinary from what we expect at its category, but all the same comforting to have. The right side hosts the power jack, card reader, and USB 2.0 port. The left flank comes with a Kensington Lock slot, an RJ-45 port for a wired Ethernet connection, a USB 3.0 port, a HDMI 2.0 port, a mini DisplayPort, a USB 3.0 port followed by a USB 3.1 (type C) and a microphone and headphone jack. The two display outputs support display of a 4k at 60Hz and the presence of a separate audio out jack and microphone jack is a welcome feature. WiFi connectivity is via Intel 9462 card that supports 802.11 ac WiFi over a 1×1 connection. It is fast, strong and stable, although not as fast as with large file downloads as a 2×2 card. The MSI GV62 8RD-200 is a mid-tier gaming rig, that based on its specifications. It comes with the 8th Generation Intel Core i5-8300H processor, 8GB of DDR4 RAM, an NVidia GTX 1050Ti graphics card, 16 GB of Intel Optane memory plus a 1TB hard disk drive. Other than Internal storage, the MSI GV62 8RD-200 comes with almost similar specs with the previous generation MSI GV62 models. Take, for instance, the MSI GL62M 7RD-1407 that comes with similar specs save for the display type, internal storage, and processors. Our review model comes with 8th Gen Intel i5-8300H while the MSI GL62M comes with a 7th Gen Intel Core i5-7300H CPU. The 8th Gen. Intel Core i5-8300H offers better hyper-threading ability as well as faster clock speeds for better overall performance than the i5-7300H. While the processor is not as powerful as the Core i7-8750H, it is sufficient to get your work done. It is unlikely to be the bottleneck in gaming and computing tasks. I’m talking about handling word processing, movie streaming, Excel work, and general multi-tasking. Photo editors will find the MSI GV62 8RD-200 handles software like PhotoShop and ACDSee simultaneously without breaking a sweat. While engineers will appreciate its capability in AutoCAD and Inventor. Content creators will also find it suitable for most rendering and creative work. We were eager to see how it faired on with a 5400rpm hard disk drive and 16 GB of Intel Optane Memory. What we found out was is well worth noting with a smile. Boot up was pretty fast, and load times were slashed to a fraction of what they would ordinarily be with a 5400rpm HDD. In short, it performs nearly as well as a laptop with an independent solid state drive. Team that with 8GBof RAM, you get a fast unit that handles both games and general work extremely well. Now, 8 GB is just enough to get all your work done with minimal inconvenience, but in case you consider upgrading, its refreshing to note that there is an extra RAM slot available under the hood, upgradeable to a maximum of 32GB. When it comes to gaming, the NVidia GTX 1050Ti graphics card does a great job handling (1080p) resolution. Shadow of Mordor managed 57fps at max setting and FHD resolution. FIFA 17 managed 110 fps at ultra setting and FHD resolution while Dirt Rally managed 65.5fps at Ultra settings and FHD resolution. Most games are playable on ultra setting and FHD resolution, although playing better at medium setting. Most gaming laptops do not offer outstanding battery life. And those that do are too heavy to move comfortably around owing to the heavy batteries installed. Performance while on battery is incomparable to when plugged into power. That’s because more often than not the battery cannot sufficiently supply all processor demanded power. That’s why it’s a good idea to stay plugged in while gaming. The MSI GV62 8RD-200 comes with a 41WHr battery, which is rather small for a gaming laptop. But in a bid to keep weight and thickness down, this was one of the sacrifices that were made. In our tests, the battery lasted between 3 and 4 hours (3hrs 45 minutes in our case). However, that varies depending on how heavy the task you are performing. For more demanding tasks, expect the life to go down to little less than 2 hours especially when gaming. Check out our detailed article explaining why Poor Battery Life robs the MSI GV62 8RD-200 of its glory. It details other variable options you can go for in place of our reviewed unit. There are definitely other options available that don’t involve you stretching your wallet too much. The MSI GV62 8RD-200’s cooling is very effective, keeping temperature comfortably low even when gaming. The fan runs silently in the background under normal load (40 dB). But get significantly loud when Cooler Boost kicks in (50 dB). The sound produced is not high pitched to get you annoyed, but rather a low-toned hum. The MSI GV62 8RD-200 is positioned as a cost-effective option for gamers and general users alike. For less than $1000, it offers a strong processor, good graphics capabilities and fast and voluminous storage. However, in a bid to keep prices down, compromises on case design and battery life were made. That robbed it some of the hype that it would have otherwise deserved. Bottom line, the MSI GV62 8RD-200 will make a great choice for gamers and general users. It is a powerful enough system for their casual computing needs and gaming, and one that won’t break the bank. Check it out at Best Buy too.